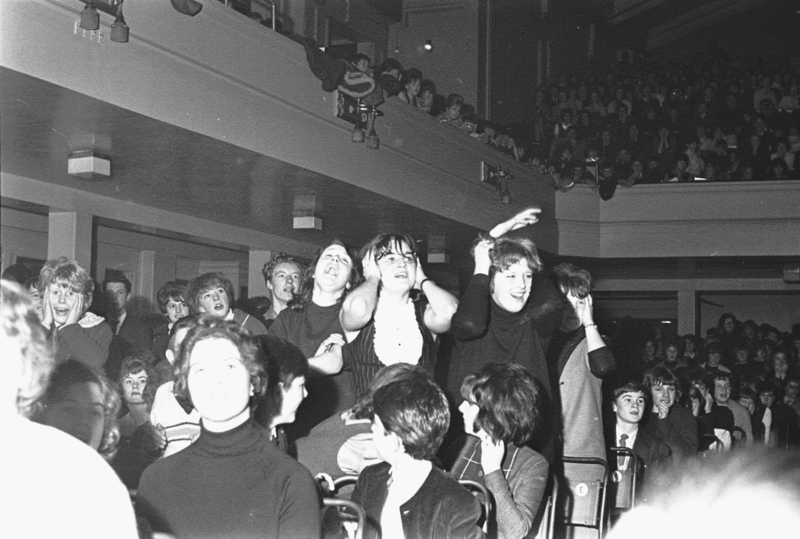 The Beatles played at De Montfort Hall three times. Sunday, March 31, 1963, December 1, 1963 and October 10, 1964. It was as if time at De Montfort Hall had gone into some kind of gloopy slow motion. From the back of the stage, John, Paul, George and Ringo confidently strode towards the crowd – and into a deafening wall of hysterical screaming. 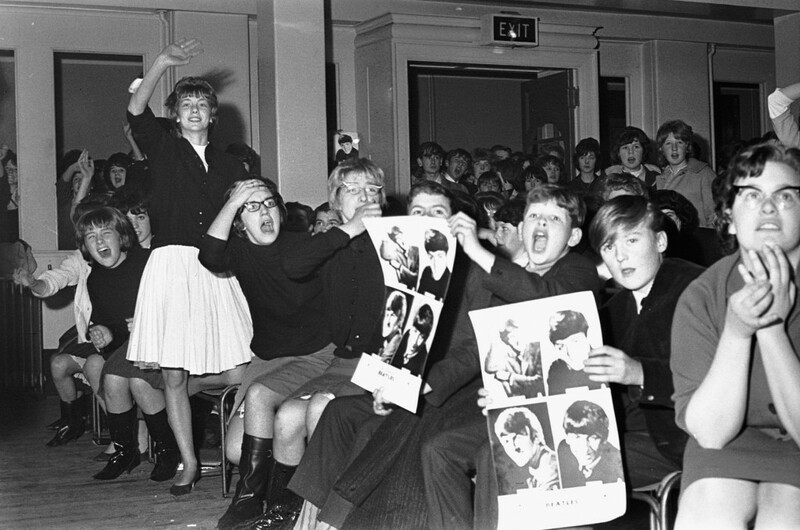 It was Sunday, December 1, 1963, and Beatlemania had touched down in Leicester. 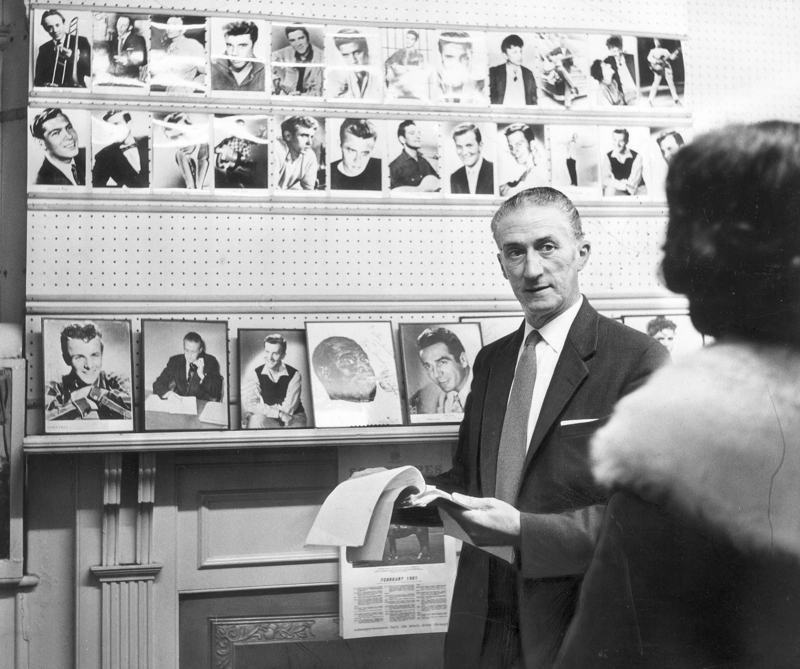 Popular music, here and the world over, was already in a state of shock. For the 3,000 children, teenagers and adults who got tickets at 3/6d each, the concert had been feverishly anticipated for weeks. In the village of Burbage, brothers Paul and Roy Wheatcroft had fed their Beatles hunger by poring over every scrap of inky newspaper they could find. On discovering the band were playing in Leicester, the 12 and 10 year old knew they had to be there. Tickets were going on sale at the Rugby Road offices of Hinckley’s Mr Showbiz – Arthur Kimbrell – at 9am on a midweek morning. Mr Kimbrell, praise his name, was the concert’s promoter. However, The Beatles had actually been to Leicester before, the March previous, but without fanfare. “Roy and I went to bed early so we could be at the office – a mile’s walk away – before 2am. We arrived to find six people before us, but we were the youngest. As it turned out, they managed to get prime seats on the front row and brought friend Nigel Dawson, 13, with them. As it turns out later, they weren’t the only ones to stop off for the jellied sweets. However, getting Beatles tickets in Leicester was a little more fraught. 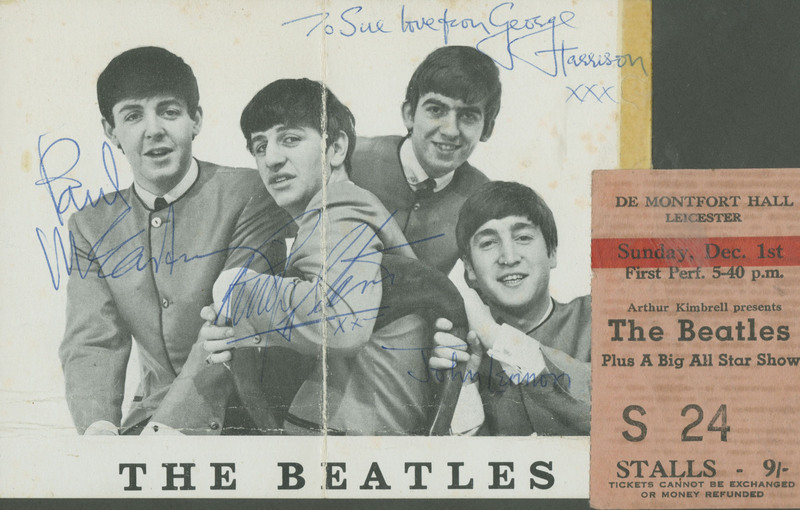 George Harrison fan Jennifer Fivaz (nee Woods) from Melton, was a schoolgirl living in West Knighton. “The main thing I remember was queuing all night for the tickets. I must have been 16 and we must have been right at the beginning of the queue. 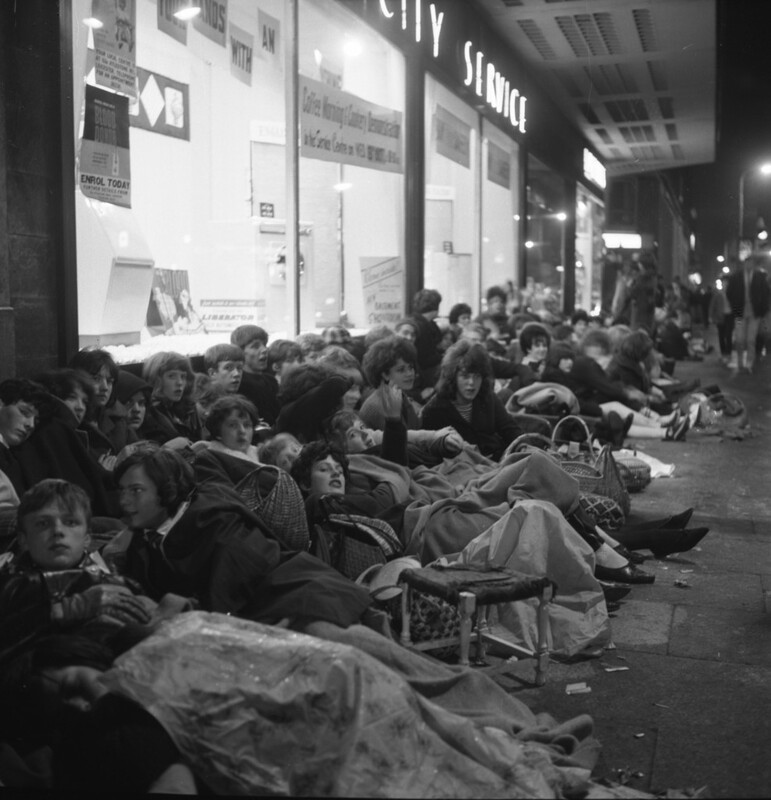 “We started queuing at 9pm and we were getting the tickets the following morning. “I remember being wrapped in a sleeping bag. In the early hours there were a lot of people in front of us. “Police were doing crowd control and they had Alsatian dogs, pushing us up against the wall and the dogs were snapping at our ankles. It was quite frightening. On the night of the performance, the gloom had set in for WPc Frances Harris (nee Edginton) who was working at Charles Street police station. 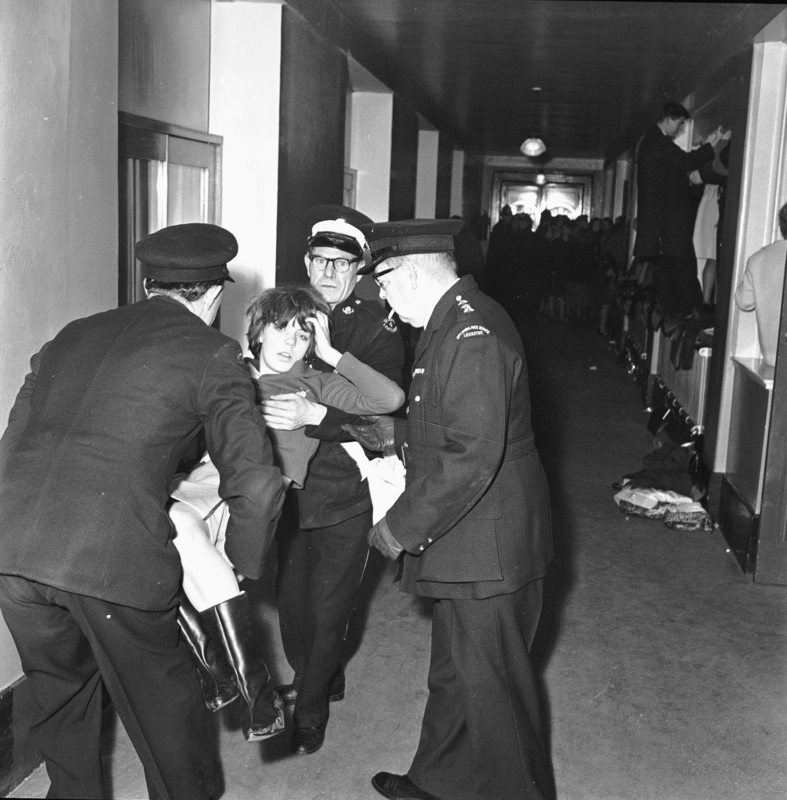 She was vexed to discover she wasn’t going to keep an eye on The Beatles during her shift – three hundred officers had already been chosen for duty. Back then, WPcs were allowed to go backstage at the hall and with that, the biggest band in Britain had been within tantalising grasp of the 20 year old fan. Frances was given messages to take to CID men in the traffic office and stomped out into the police station’s cobbled yard, and into the traffic room. On the return journey she half noticed a dark car in the quad, and marched back to the control room still fuming. Sensing her displeasure, the traffic sergeant started asking her about The Beatles, and if she liked them. Of course she did, was her response. Although she didn’t let slip that John Lennon was her favourite. “He said ‘they are in our enclosure, in the quad’,” recalls Frances. 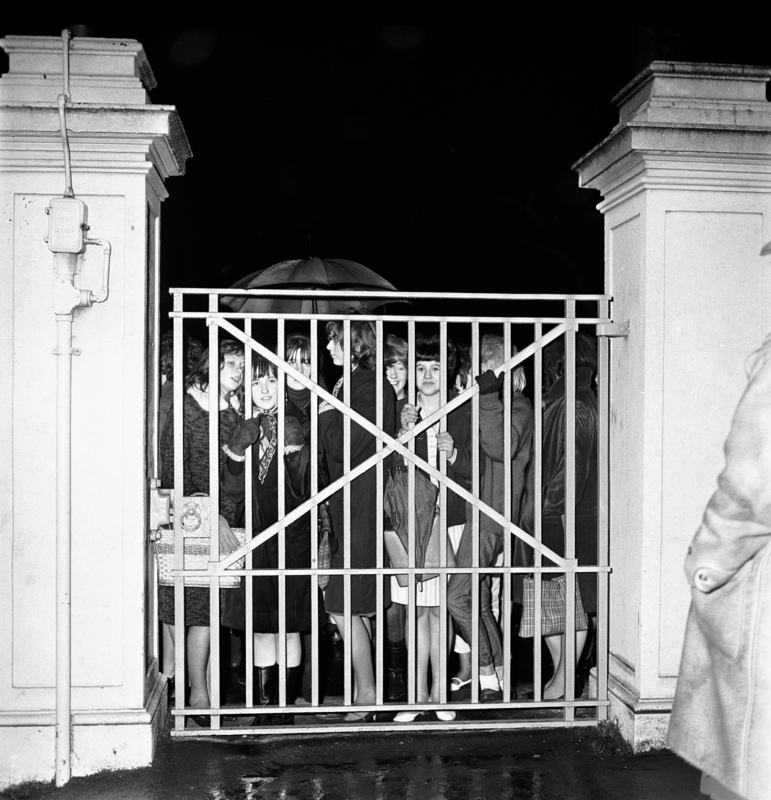 “They’d brought them in the side door and just left them in the car, to keep them safe from the fans. I didn’t even think to look in. Squashed in the van, the lads kept themselves to themselves and passed the time listening to a radio. Sadly, the car had gone by the time the WPc had learned the truth. “I probably got nearer to them than anybody,” says Frances, who lives in Leicester’s Narborough Road South. “I was so annoyed I didn’t even think. It was evening and it was dark in there. It taught me a lesson: You keep your eyes open. The screams and heat inside De Montfort Hall were escalating as The Beatles, the biggest band in England, arrived ignominiously in the back of a Leicestershire Constabulary dog van. 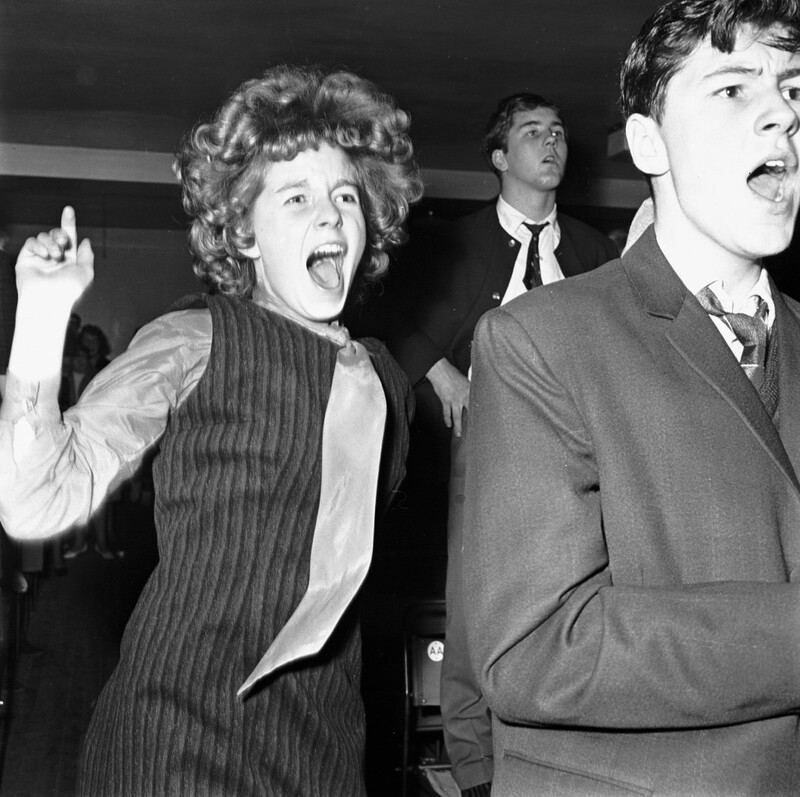 All night, no-one had heard a note from support acts the Vernon Girls or Peter Jay and the Jay Walkers. And then, the time had come. The Beatles, entering from the back and middle of the stage, took up their positions. The crowd went wild. “It was absolute bedlam,” remembers Geoffrey Freeman, a semi-retired warehouseman from Evington. “When they came on stage you couldn’t hear a thing. “It was fantastic. I could see the stage and I could see John and Paul and George. There was a post, and so I couldn’t see Ringo or his drum kit. “I think there was just one song they played I could actually hear. I think it was Please Please Me and most of the time all I could see was people jumping up and down in front of me. “I’d always been a Beatles fan, right from the start,” says Geoffrey, who was 19. “I’d picked up on it early. It wasn’t long before the heat and hysteria took its toll. Within minutes, girl after girl started fainting, and the police, along with St John Ambulance, had a fight on their hands. Janice Benfield (nee Barnwell), was 18, and working at Frears and Black bakery, where Abbey Park’s B&Q is today. She went with three other girls from work. It was steaming inside De Montfort and very, very loud, she recalls. 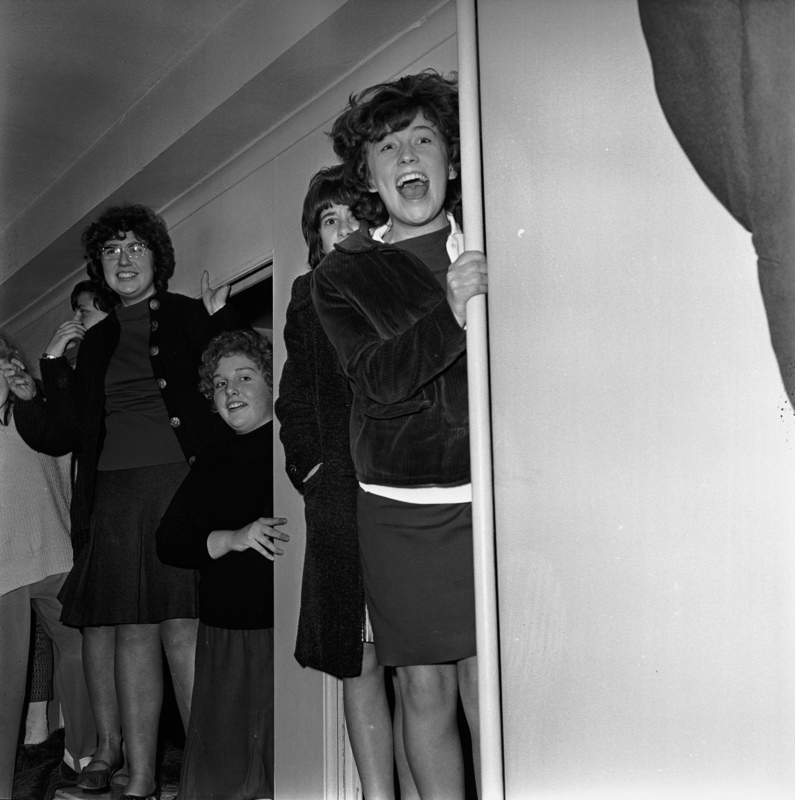 “Some girl who fainted was passed over our heads, nearly knocking our hair off!” she says. “It was very, very noisy and very hot. God was it hot. “Oh God,” she sniggers, “I was one of them girls. I loved John. I loved him. I had my eyes on him all night. I couldn’t hear the music; they only had to move and the screams went up. It didn’t spoil the show, though. They only had to open their mouths and the girls would go bonkers. “It was a brilliant night, I’ve never forgotten what it was like. Eric Bridding, a pensioner from Lincolnshire, was six rows from the front and “never heard a sound all night”. “But,” he says, “I did see their mouths move. Mind you, I was old even then,” he laughs. 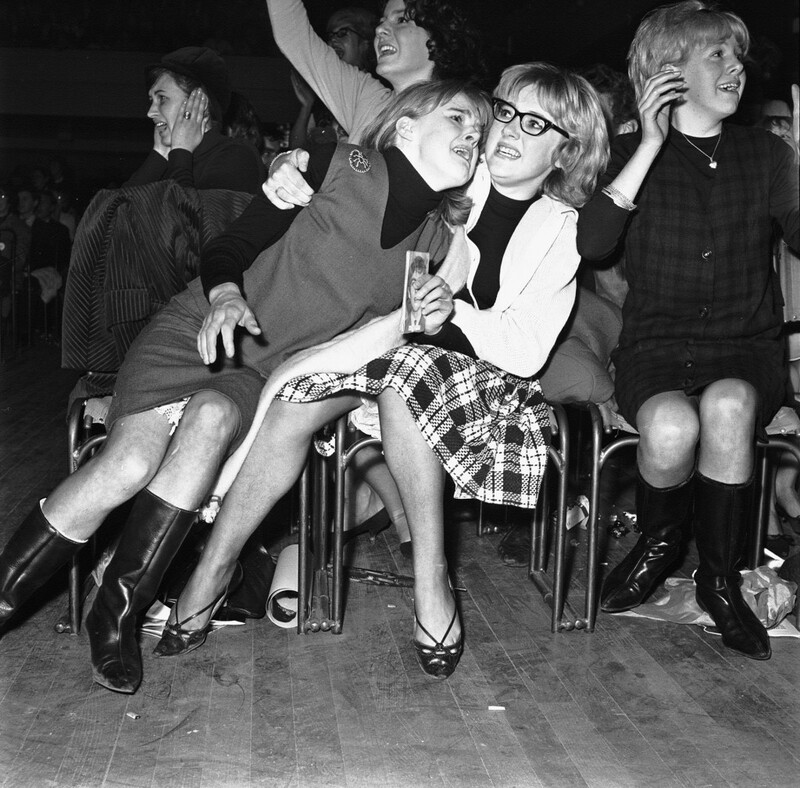 Fourteen year old Jo Harrison (nee Meadows) spent most of the evening stood on a chair in Row Y, seat 39. The mum of two from Oadby was with friend Sheila Angrave and the pair were schoolgirls at Oadby’s Beauchamp College. “It was quite scary, just the sheer hysteria. You were there and everyone around you was screaming. I wasn’t very big and I’m not very tall now. “We stood on chairs rather than sit down. I remember the screaming starting fairly early. Although, when they came on stage, it went so loud that it went into a hiss. Jo, a retired children’s speech therapist, still has the gold brochure from the gig and priceless memories. Of course, the room wasn’t just full of hysterical screaming fans. It was also full of hysterical screaming fans with bags of Jelly Babies. 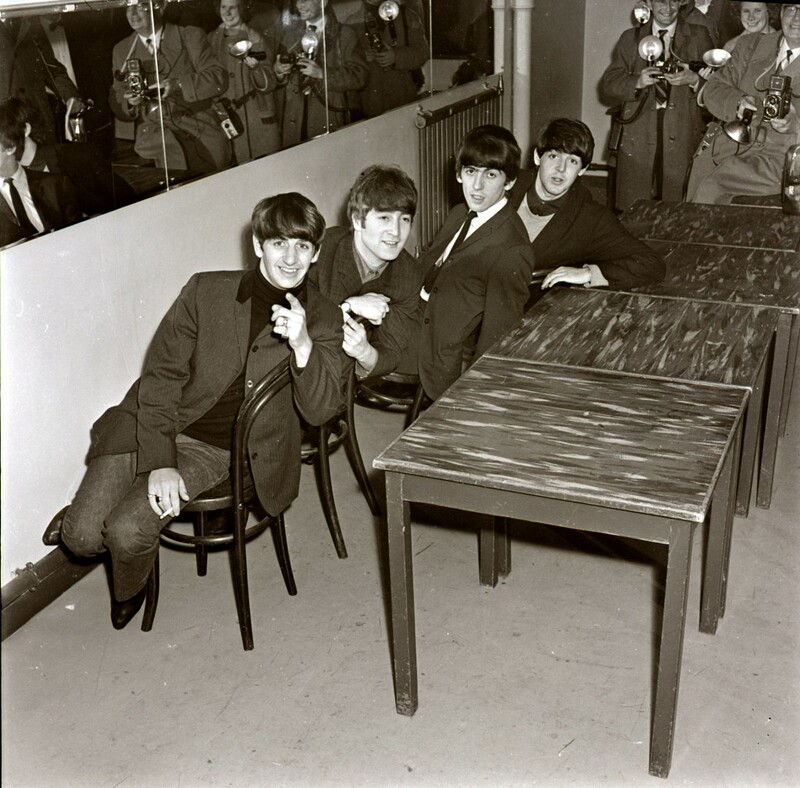 The Beatles had told a radio presenter they were the band’s favourite confectionery. 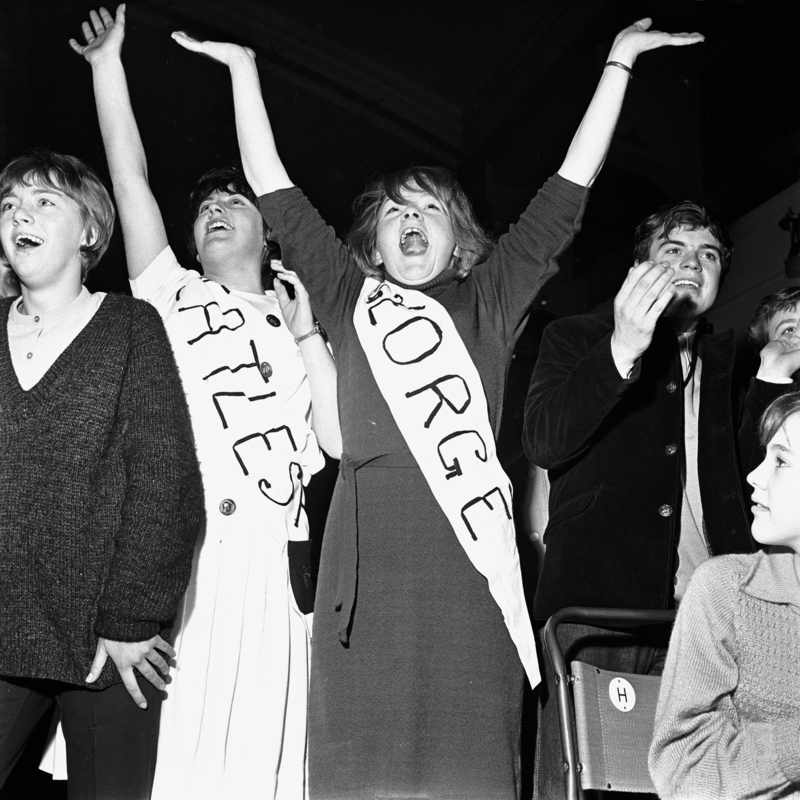 Teenagers Carole Digby and cousin Sandra Boyer were among the numbers at De Montfort. “We’d heard that Paul McCartney liked Jelly Babies, so we went to Woolworths and bought a 1lb bag,” says Carole, a teaching assistant at English Martyrs. “The security guards had threatened to throw people out if any more were thrown on stage, but we carried on. It was raining Jelly Babies a few seats forward on the front row, remembers Paul Wheatcroft. “Within minutes of The Beatles being on stage, one or two people started to throw the occasional jelly baby but soon it was a barrage. My brother opened his box and threw one or two and a policeman in front of the stage pointed at him and shook his head. So my brother had to continue throwing cautiously. Forklift truck driver Nigel Dawson was sat next to Paul and his brother Roy. For all three, The Beatles were the first band they ever saw live. Teresa Ashton (nee Richardson) was 14 and living on Eyres Monsell estate with her family. She was a fan of blond boy wonder Adam Faith at the time and The Beatles meant nothing to her. If it wasn’t for her good friend Ann Lawrence’s convincing entreaties, she would never have gone. But, lucky for her, she did: “It was the most wonderful experience ever,” she says, reminiscing from her home in Barrow on Soar. “It was very noisy and happy; I made several new friends that night. I particularly remember coming out with a sore throat with all the screaming and shouting. “I also got into a lot of trouble when I got home late. A similar version to this story was first published in the Leicestershire Chronicle. Image copyright the Leicester Mercury.